Good news for anyone dreaming of summer vegetables: Even a postage stamp–size yard can grow plenty of food. “The trick is to prioritize favorites and properly appraise your land,” says Dan Allen, . Here’s what you need to know to reap bounty from modest parcels. 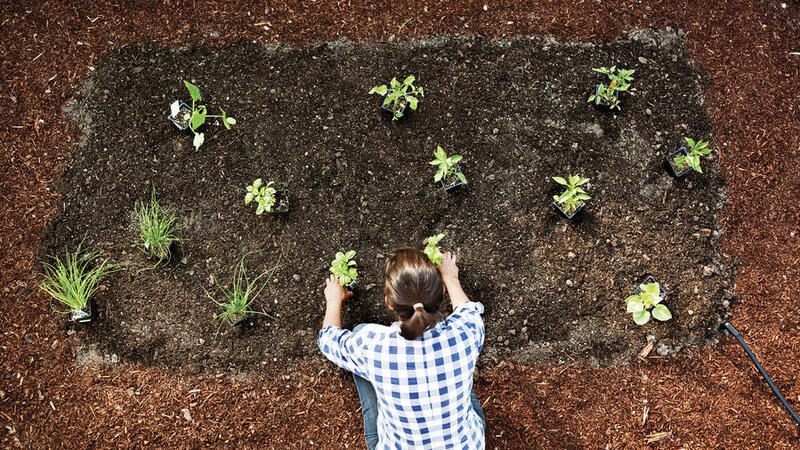 Before planting in- ground, test soil for toxic heavy metals. Mail samples to UMass Amherst ($55). Track the sun’s arc through your yard (plus projections for the entire year) with the . Fruiting crops like tomatoes need 6 to 8 hours of full sun; some herbs and leafy greens can handle 4 to 6 hours. Have a trellis or fence? Consider climbing varieties like beans, cucumbers, and peas. 1. Add fresh compost to new or existing beds, plus a few handfuls of organic granular fertilizer. 2. Use a garden fork to turn in amendments and loosen up compacted areas; rake smooth and remove large chunks of clay. 3. Check your irrigation for breaks, leaks, and blocks before planting. 4. Follow spacing instructions on seed packets and plant tags. Picture each crop at their future fullest and give them room to thrive. 5. Mulch around seedlings with a 1-inch top-dressing to retain moisture. ‘Sun Gold’ tomato—You can’t help but snack on these sweet orange cherries. Each plant grows up to 10 feet tall, so place a cage over it when small and manageable. Shishito pepper—Low-maintenance and hands-off, but super prolific. ‘Sugar Snap’ pea—Munch on green pods and white flowers, or add delicate tops and tendrils to stir-fries. Grows vigorous vines; be sure to trellis. Leafy salad mixes—From spicy to crunchy, find seed combos for all palates. Handles partial shade in summer, but amend soil with lots of compost. Invest in good soil and avoid cheaper options that do more harm than good. For added nutrition and a finer texture, Allen recommends G&B ­Organics Blue Ribbon Blend. Water regularly. Food crops are thirsty and crave consistency; make a schedule and stick to it. Watch for curled, spotted, or dropped leaves—they can be signs of pests, disease, and ­over- or under-watering. Treat and make adjustments when the first signs of trouble appear. Spend time in the garden! Slow down and enjoy your space while you tend to it. Plus, regular pruning, harvesting, ­and trellising prevents headaches down the line.